JVC GY-HM200 live IP streaming camera used for sports production. Boston, May 2016: It has been a cold, rainy spring in Boston, but that hasn’t stopped the video team at Harvard University from hitting the Charles River and offering viewers a unique take on collegiate rowing. Having broadcast rowing events live for a handful of years, Harvard is one of the best and most experienced outfits in the industry when it comes to producing coverage of the sport and has been entrusted with providing broadcast support for the Ivy League Rowing Championships on Mercer Lake in West Windsor, NJ, this Sunday. Coming into 2016, however, the crew was looking to step up its game with a more streamlined approach to operations. To handle the challenges of inclement weather and to minimize the number of people needed out on the water to make the show possible, Harvard deployed the new JVC GY-HM200 camera, which was introduced at last year’s SVG Summit and made its NAB Show debut last month. The camera’s built-in graphics and character generator allows Harvard to eliminate the need for a laptop (which was difficult to use and protect in the rain). 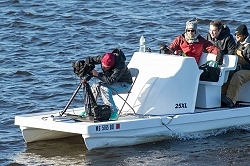 A complete show is produced inside the camera and taken via SDI to a TVU backpack, which is capable of transmitting the signal from the boat on the Charles River. Halevi was able to work with JVC to integrate the custom Ivy League Digital Network graphics package into the camera, and the camera operator can manipulate the graphics on an accompanying tablet. The new workflow is able to reduce the number of people on the production boat to four (a driver, a camera operator, and two commentators) and uses equipment that can easily be protected from the elements. As for keeping the commentators on the boat and not using a form of at-home production with the announce team on land calling the action off a monitor, Halevi believes their presence is critical to the authenticity of the show. Halevi’s team will use a different workflow for this weekend’s Ivy League Rowing Championships. His crew will still use the JVC GY-HM200 but will not use the in-camera graphics system. With the way Mercer Lake is laid out, his production will need two cameras, requiring a production switcher on land near the finish line. The camera’s built-in transmission system will be used, however: in this case, taking RTSP (real-time streaming protocol) out of the camera to the switcher. Harvard has partnered with Ubiquity to cover the lake in a long-range WiFi network that will boost connectivity and eliminate the need for the TVU pack.